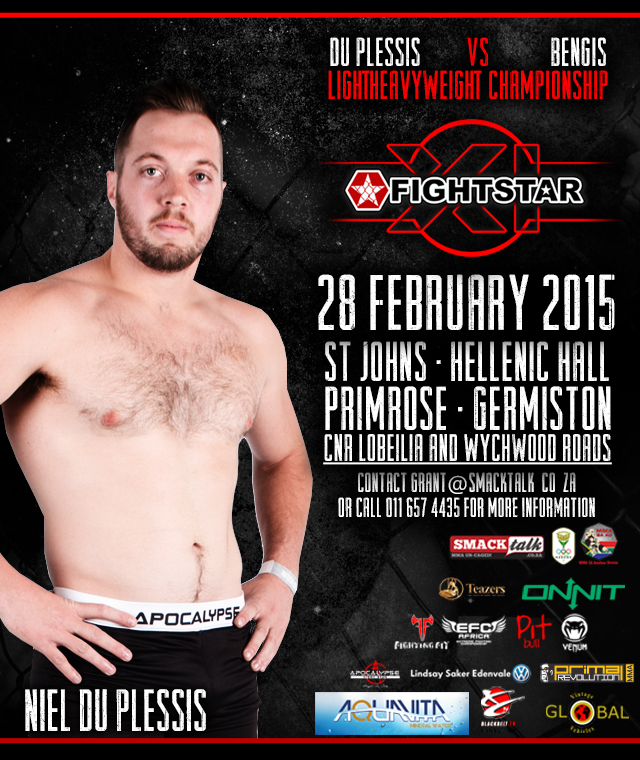 We caught up with Niel Du Plessis ahead of his title fight at Fightstar 11 to find out more about one of South Africa’s best amateur MMA athletes and his training leading up to his Light-heavyweight title fight. I am Niel du Plessis, I attended High School Hartbeespoort , and after school I went to study law at the University of Pretoria, which I enjoyed extremely and have been staying in Pretoria ever since. I’m currently a candidate attorney at Cavanagh Incorporated Attorneys. I used to compete in Judo since I was at the age of nine, we once saw a seminar at school and my brothers and I joined the sport. We enjoyed competing tremendously, and that was the start of our passion for fighting/ competing in martial arts. My younger brother Dricus du Plessis won the world title in K1, and afterwards he requested that I stop enjoying varsity partying as much and start training with him. I started training kick-boxing and as soon as CIT opened an amateur division, I immediately started MMA training. The short answer is that I’ve been training in MMA for a year, but I have been training in different aspects of martial arts respectively for three to four years. Where do you train out of and which other athletes do you train with? I’m a proud member of CIT-MMA, I mostly get trained by Dricus or Leon Mynhardt, which is pretty amazing, and Quaid Openshaw (FS middleweight- title holder) is one of the training partners with whom I train a lot, he is my sparring partner. Marino Cutendana is always at the gym training or helping us as well, so I have a lot of professional experience around to help out. Your fight against Merrick Bengis, would you describe this as the biggest fight you’ve had with the title on the line? Definitely my biggest fight up to date, but it is great wanting an accomplishment as bad, the motivation of a title feels great! What would winning this title mean to you? How has your camp been so far? My camp thus far has been tough with December passing, but fortunately “Iron Lion” is in camp, which has a lot of advantages for me, and Dricus has just recently made his return from training at Tiger Muay-Thai and MMA in Thailand, and luckily what he learnt there gets drilled into me! Have you seen Bengis fight before? What do you think of his fighting style? I have not seen him fight before, but he has (from what I heard) a very impressive record. I know his team has exceptional tactical style/ technique but I’ll be stupid in making assumptions about his techniques and skill. I stick to training my game plan and developing my technique, in order to be readily equipped for whatever the night delivers. Does it bother you that he comes out of FFM, one of SA’s top MMA gyms? It does not bother me, but it does excite me. FFM and CIT are the top gyms in SA and I’m proud to be able to represent CIT at amateur level going for my title. It helps my mind set knowing I should utilize ever training session I have, because he himself also has useful resources at hand. He has a great team, but he still has to fight me alone, which explains the excitement. Do you have anything to say to Merrick Bengis? Anything you’d like to say to your friends, family, team, fans and sponsors? Since starting MMA, I’ve met a lot of people in the fighting industry, from all different styles and clubs. Most of these people which I now call friends always have some motivation or techniques to share. I’d like to thank everyone who has helped in one way or another! It is great being part of the fighting community, thanks for the friendship and support! In our family if anybody attempts a sport or activity, the rest will either support or join. Which means they’ve always been there and will be, thanks to them for what they mean to me, I appreciate every time I can look over my shoulder, and find you there! Team Du Plessis. Especially Dricus for forcing me of the couch and into this lifestyle. Thank you Team CIT, training is my favourite part of the day and you are the reason. Thanks to Fight Star for giving us amateurs a platform to compete and developing our careers, I very much appreciate the organisation. Thank you very much to Snake Eyes MMA, I am honoured to be part of your brand.